Believe it or not, MMA isn’t that old. Of course, mixing martial arts to beat someone up has existed since the beginning of time. Still, the modern combat sport of MMA as we know it has only been around since 1993 when the UFC put on their first fight between a giant sumo wrestler and a karate blackbelt who was about half his size. That first UFC tournament didn’t have weight classes or even gloves and a 160lb Brazilian from the legendary Gracie Family came in and made everyone tap out in a single night. Royce Gracie showed the world that night what Brazilian Jiu Jitsu was and forever changed the landscape of martial arts. Below you will find three of the best MMA fights since that first UFC tournament made MMA what it is today. Everyone has their own opinion of what the best MMA fights in history are and what makes up a great fight. For me, the following fights are the most fun to watch and I’ll explain why. MMA was growing rapidly but it wasn’t until Zuffa, then-parent company to the UFC, took a huge risk and invested in the creation of The Ultimate Fighter reality show. It was the show that caused the sport to really start its launch into the mainstream. MMA still had a stigma attached to it because of the inherent brutality of the sport. The show allowed people the opportunity to see that these fighters weren’t brainless brutes outside of the cage. People started to release the negative stigma and the show was a huge hit, but there was still something missing. MMA didn’t have that noble quality that boxing had. It hadn’t shown that heart and determination, it hadn’t had that indomitable sports moment that runs chills up your spine. But it was about to. The final fight in The Ultimate Fighter Tournament was between Forest Griffin and Stephan Bonnar and it went down in most brutal and poetic way possible. It was that beautiful, violent, heart-filled, sports moment full of dramatic seconds and incredible exchanges that really made people see something truly astounding. It was that profound moment of true expression that MMA needed. Audiences surged to an estimated 8 million viewers during the finale between Griffin and Bonnar that night. Griffin came out the victor but the 6-figure UFC contract was awarded to both fighters for the heart and determination that they showed in the cage that night. Nick Diaz and Takanori Gomi are modern legends of the sport of MMA. Both have over 30 professional fights and have won championships in top organizations all around the world. Nick Diaz had a tumultuous past with the UFC constantly getting into arguments about fighter pay and treatment and frequently displaying a contempt for all sorts of media. He had come off 2 consecutive wins in the UFC but still didn’t trust Dana White to keep him in the organization for long so he opted out and signed with Pride Fighting Championships. Pride FC was the only other organization at the time that had such high-level fighters. This era in MMA was the last time that I can remember any real competition to the UFC’s pinnacle of talent. Pride was incredible and back in those days their attendance numbers blew UFC’s out of the water. At the time of the fight, Gomi had been on a rampage. Just a couple years before this, with just 1 TKO on his record, he hit a sprint in his career and just started knocking everyone out that they put in front of him. Winning 13 of the 14 bouts before his fight in Nick Diaz. He finished 11 of them. Nick Diaz aint’ scared, homie, (delete this before posting – only for clarification for you –Nick Diaz and his brother Nate own a clothing brand “don’t be scared homie”) so he signed a two-fight deal with the Japanese mega promotion and his first fight was slated to be with their best, Gomi. The fight starts, Nick instantly starts to pressure forward but Gomi shoots for an immediate takedown and gets it. Nick Diaz is a blackbelt in Brazilian Jiu Jitsu under Caesar Gracie and is very proud of his grappling lineage, so, he has no problems fighting off his back. The fight appears to stalemate as Gomi looks to be the slightly more dominant fighter throwing largely missed or blocked ground and pound blows to the forearms and shoulders of Nick Diaz. When fight progressed back the feet Nick started to take over landing peppering shots, punches in bunches and rocking the Pride Lightweight Champion on multiple occasions. He was hitting him with multiple jabs at a time, following up with the long straight cross using his huge reach advantage to keep Gomi on the ropes and desperately defending and winging uncalculated haymakers in fear. He was coming on strong and things were getting bad for Gomi. BAM! Gomi drops a bomb on Diaz and drops him to the mat. Now they are grappling again and Diaz is rocked taking big blows on the ground and frantically changing positions. Diaz retained guard and recovered. Gomi was aware of the grappling pedigree of the American and decided to stand the fight up instead. That was a bad decision for the Fireball kid. Nick Diaz is famously a marathon runner and comes on strong in the later stages of fights. With only a minute left in the first round, Gomi was already gassed out and had his hands down just taking punishing blows from the aggressive Stockton, California native. The genius in Nick Diaz’s boxing is that he never throws 100% power in any of his shots. Instead, he has the philosophy of overwhelming his opponents with sheer output and consistency. He just keeps a jab in your face and then starts to follow it up. It works for him too, he frequently gasses his opponents out by keeping a solid and consistent pace on them the entire time, speeding up as the fight goes on instead of slowing down. Much like a marathon runner would. A minute into the second round, Diaz has two deep cuts on his face from wild overhands and hooks thrown by Gomi and the doctors threaten to stop the fight. They don’t, the fight continues and Diaz looks dominant with blood streaming down his face. As Nick backs Gomi into the corner, Gomi shoots a beautiful takedown and shows the world what a World Champion’s technique looks like. Nick responds in kind and he secures his ankle under the chin of Gomi, trapping his arm instantly upon hitting the ground. He then works to finish the rarest submission in the history of MMA and with just a little tweak to his squeeze, chokes out the Lightweight World Champion of the biggest international MMA organization in the world at the time with a gogoplata. To date, there are perhaps only 4 or 5 people that the internet can recall that have ever successfully pulled off a gogoplata in an MMA fight. Shortly after the fight, the Nevada State Athletic Commission took the win off the books, ruling it a no contest, and fining Nick Diaz $3,000 dollars for testing positive for marijuana in the post-fight drug test. A hefty fine for the time considering Diaz only made $15k. The harshness of the fine resulted primarily from the commissions belief that Nick Diaz was high at the time of the fight. Apparently, the plant was a performance enhancer in the way of dulling Diaz’s pain senses. Recap, Nick Diaz submits one of the world’s most dangerous fighters with one of the world’s rarest and most difficult submissions, doing so while so stoned that he tested nearly 12 times higher than the average positive test. His main method of attrition was cardio too! This one trumped Diego Sanchez vs. Gilbert Melendez only because it was for a world championship. Honestly, I can’t tell you which fight was better because I have refused to decide! 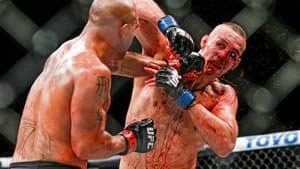 One of the bloodiest and most brutal fights I have ever seen. The story on this side of the fight really starts with Robbie Lawler’s decision loss to Johny (for Carrie only: his name is not a typo, he spells his name this way) Hendricks for the vacant welterweight title in March of 2014 after Georges St. Pierre retired. After that loss, Lawler found himself refocused and went on a rampage through the ranks of the UFC 170lb division. Over the course of 7 months, Robbie Lawler had fought 3 times, recorded close to 70 minutes of cage time, and beat Johny Hendricks in the rematch to become the undisputed Welterweight World Champion of the UFC. It was the best Robbie Lawler that the world has ever seen. Rory’s path to redemption started before that. He was coming off a 5-fight win streak over top competition like BJ Penn and Nate Diaz and hadn’t lost in over 3 years. Georges St. Pierre had already started talking about retirement and the UFC brass was looking for someone to fill his shoes when they matched up Rory Macdonald vs Robbie Lawler I at UFC 167 as a title eliminator. Rory lost that fight by decision and Robbie went on to face Johny Hendricks for the vacant welterweight title later that year. Rory has been quoted since then, mentioning how he wasn’t mentally or physically prepared enough for their first encounter and that he would do whatever he could for the rematch. Robbie Lawler’s coach knew that they would be fighting Rory MacDonald again at some point after their first encounter. After winning the welterweight title, Lawler had the chance to take some time off and let his body fully recover from the brutal 7 months that he put it through leading up. Nearly 5 months later, he was ready for another brutal war and this time It was a rematch with Rory MacDonald. That time was spent resting for MacDonald as well. He was coming off a TKO victory over Tarec Saffiedine and on a three-fight win streak since fighting Lawler at UFC 167. His mentor, Georges St. Pierre was a long-time training partner of his and the last man to defend the welterweight title. Still undefended in the hands of Robbie Lawler, the Championship was still ripe to change hands again. Rory looked dominant in his wins over Damian Maia, and current Welterweight Champion, Tyron Woodley, before his TKO of Saffiedine and looked like he was in prime form for UFC 189 to meet Lawler in the co-main event. The fight started with an uncharacteristically patient Robbie Lawler as Rory started to find his mark early with an unconventional front kick to the mid-section that he found to land pretty consistently. By the end of the second round both fighters were showing the marks of battle and things were starting to heat up. Robbie Lawler lives in the heat of battle, as a spectator you can tell that he thrives on it. He is completely unique in the way he gets lit up in fights no matter how tired or hurt he is. As the fighters exchanged in the middle of the octagon you can see the molten core of both fighters as they both refused to back down in anyway. Robbie’s raw passion highlighted the passion that was in Rory. It was a beautiful sight to see. The third round starts off with Robbie slipping under the typical overhand-upper jab counter by Rory and landing looping bombs. Firas Zahabi, the trainer of both Rory MacDonald and Georges St. Pierre, was worried that Rory was getting a bit too anxious as he fought. Both the commentators also commented on how well the patience was working out for Lawler and how impressive it was to see such a technical and dramatic change in fighting style from the champion. Lawler was controlled the action and starting to break away in the third round when Rory reared back and caught him with a huge head kick that was so powerful it rocked Robbie through his block. Rory didn’t let up. He followed the champion to the cage and pounced on him, using his left arm to measure and the right to deliver vicious elbows that were flying in with technical precision. Robbie survived the round but was visibly hurt and wobbled on his way back to the stool. Starting the fourth round both fighters look like a scene out of a horror movie. This is the first time Rory MacDonald has ever been in the championship rounds but he doesn’t look fatigued. Motivated by a badly hurt Robbie Lawler, Rory went right back to that head kick was being partially blocked by Lawler, yet still hurting him. He used that as a jumping off point for vicious combos against the cage. A swift flying knee lands on the chin of Lawler and you can tell he’s in trouble. Robbie Lawler is known for his toughness and he got a chance to show it here. Rory’s grit and determination to finish this fight was illuminating Robbie’s to never quit. As the bell rang to signal the end of the fourth round, both fighters dropped their hands and stood in the center of the octagon staring at each other, spitting out blood and refusing to give even an inch in their gaze. It was a moment in time that can never be duplicated. Instead of rushing back to their stools to rest, they chose to stand in the fire and enjoy the heat on their faces. An Incredible moment that will live on in the history of MMA forever. Robbie came out in the fifth-round breathing fire and Rory met him with equal fervor. Towards the end of the round, the damage was too much on an already shattered nose of Rory. Lawler landed a clean jab and dropped the challenger, finishing him off with punches on the ground in the 5th round of an incredible fight and an incredible expression of talent and passion by both fighters.